As much as I love getting tips and recommendations about restaurants, there is a downside. If praise is too effusive, it raises expectations. Unmet expectations lead to disappointment. 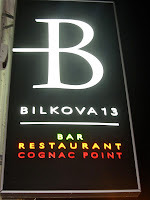 I heard and read good things about Bilkova 13, but for some reason, I was still uninspired, and my expectations were still in check. 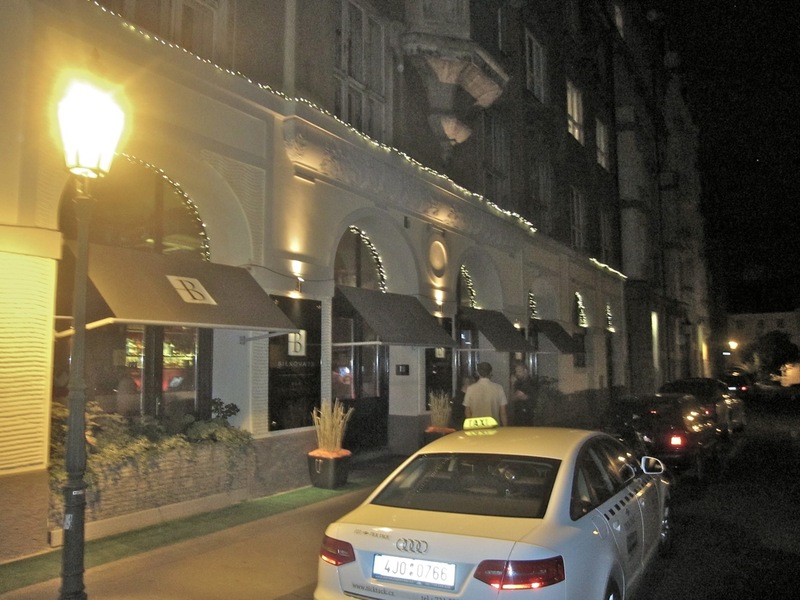 Finally, a friend talked me into going down to Old Town, near the Intercontinental Hotel, to check it out. 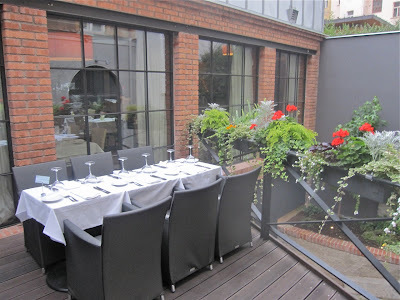 The name of the restaurant is also the address. With few expectations as to what the place actually looked like, I was impressed. The restaurant is huge. 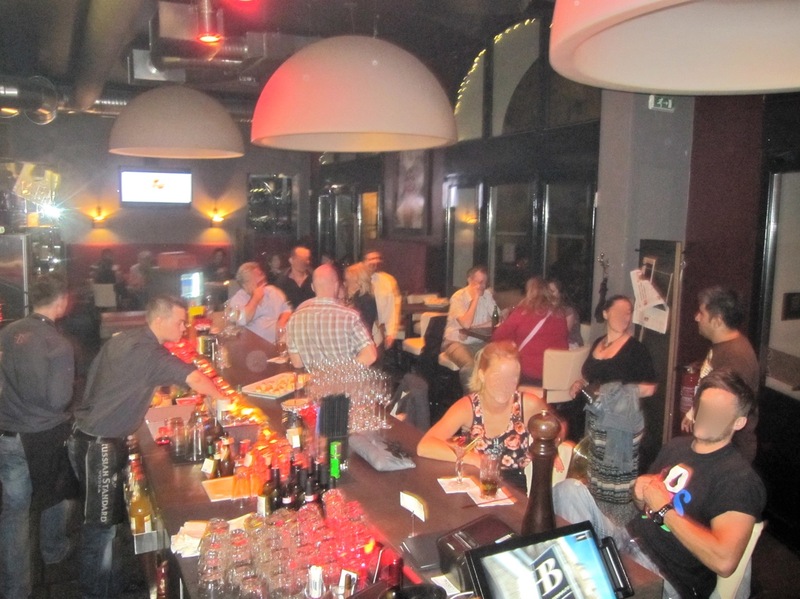 There's a usually bustling bar area in front. There's a room with tables for people who want to sit down and drink. Once you pass through that part, there's a big, multi-level dining room in the back. There are glassed-in wine racks, faux-hardwood floors, exposed duct work, brick walls and steel beams. I thought the modern-industrial look worked fairly well. 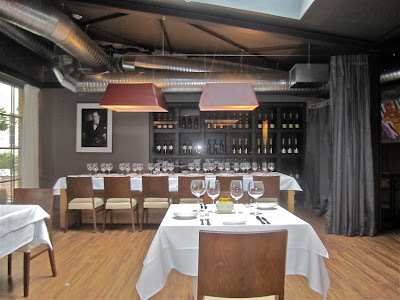 Some dining areas can be made private with the use of curtains on tracks in the ceiling. There's space for just a few outside tables. 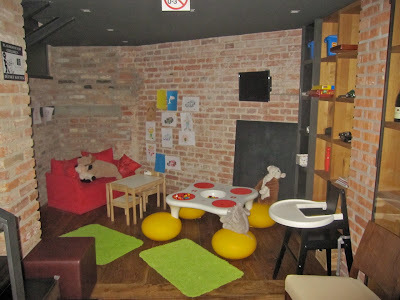 There's a play area for kids. 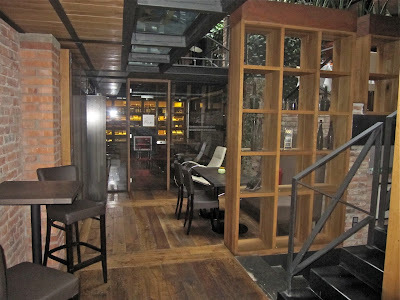 And there's a play area for adults -- a special "Cognac Point" with fine liquors and a cigar room. A paid membership is required for that part. We sat down and were greeted by a very friendly waiter. The music had to be some eclectic playlist on shuffle. It went from "Shine On You Crazy Diamond" by Pink Floyd (which I loved) to "I Need Somebody" by Bryan Adams (not so much). We started with crystal flutes of Pizzolato extra dry prosecco (75 CZK each). We had a big bottle of Mattoni sparkling mineral water (95 CZK). 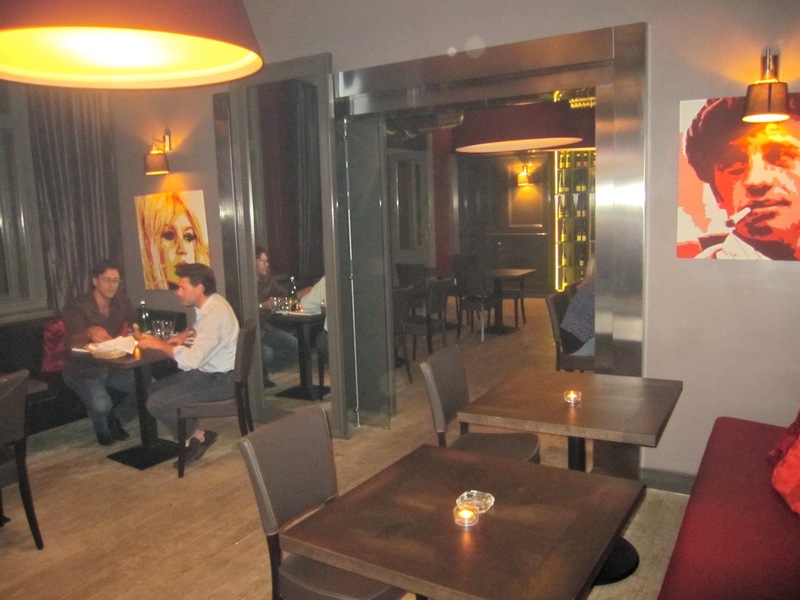 The house wine I had, a Pinot Grigio from Veneto, was dry and light (.2 liter/90 CZK). 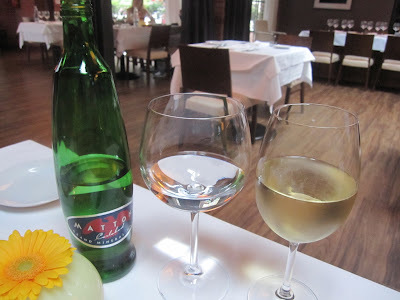 The Alsatian Pinot Gris was sweeter and less to my taste (.2 liter/130 CZK). 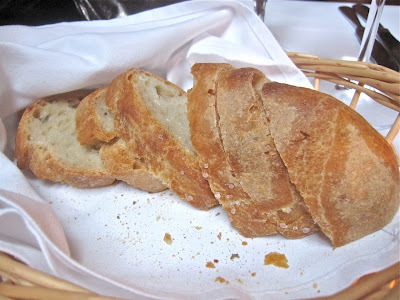 The bread basket had good slices of Italian bread with salt crystals. With that, the waiter gave us something we'd never seen before: olive oil with an island of tart, grated Parmesan in the middle. We both liked the combination a lot. 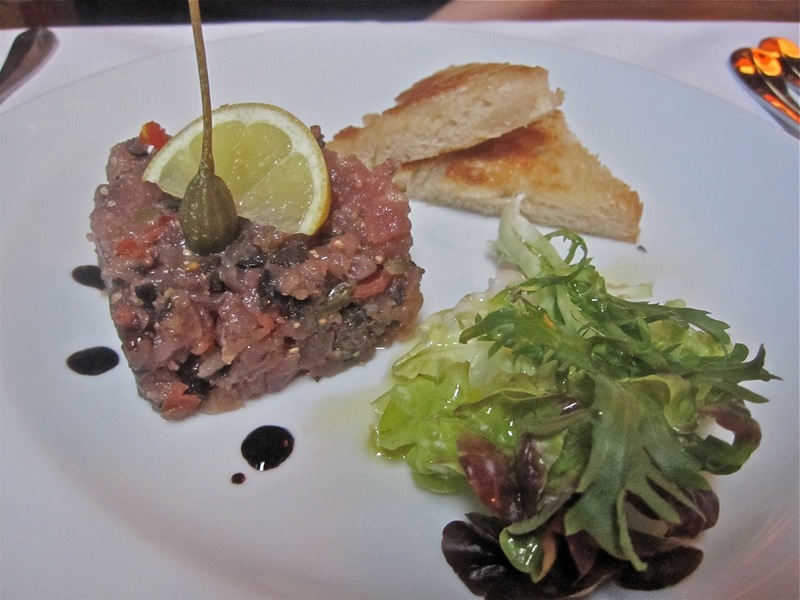 One starter was the tuna tartare (230 CZK). On the menu, it says in English that it is salmon tartare. In Czech, it correctly says it is tuna. It is definitely one of the most creative and tasty iterations I've had. The decent-sized, squared-off portion was mixed with tomato, caper, olive, and lemon. I thought olives might overwhelm the flavor, but the mild black ones worked well. 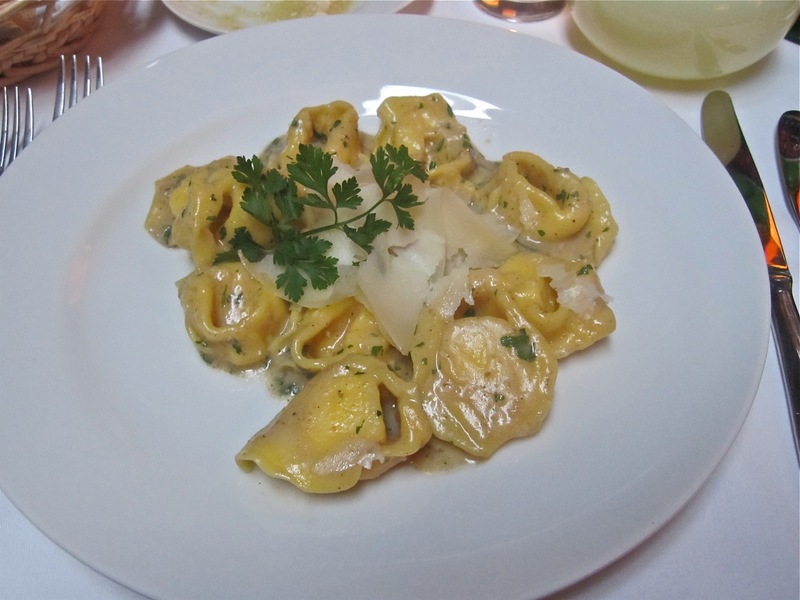 The other starter was the tortellini with fresh black truffle, butter and Parmesan (210 CZK). 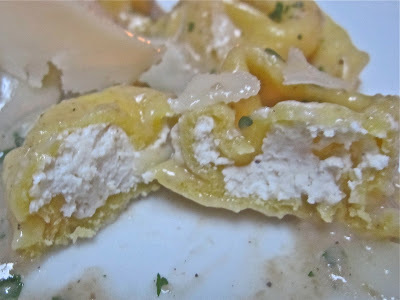 Even before I took a bite, I inhaled the intoxicating aroma of truffle (though I wondered if any of that was truffle oil). The tortellini were very plump and well-stuffed with snowy-white ricotta. The rich, mushroomy sauce was delicious. It was a generous portion and I enjoyed it very much. The only issue I had was it was not very hot and too al dente for me. But my friend thought it was just right. Note that the menu says they also have gluten-free pasta available for those with celiac issues. For a main course, my friend had the sea bass (360 CZK). The kitchen removed the bones on request. The fish was moist and had a clean, fresh flavor. 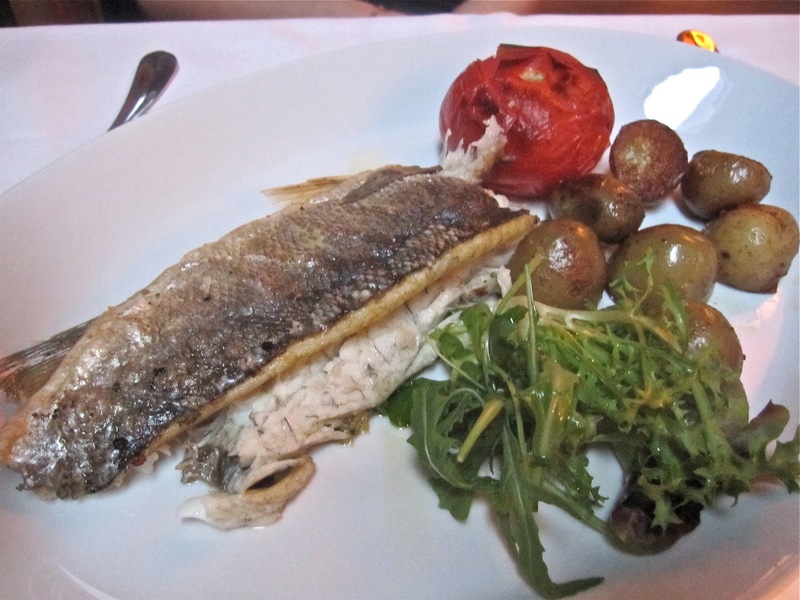 It came with buttered new potatoes, a small rucola salad, and a roasted tomato on the side. 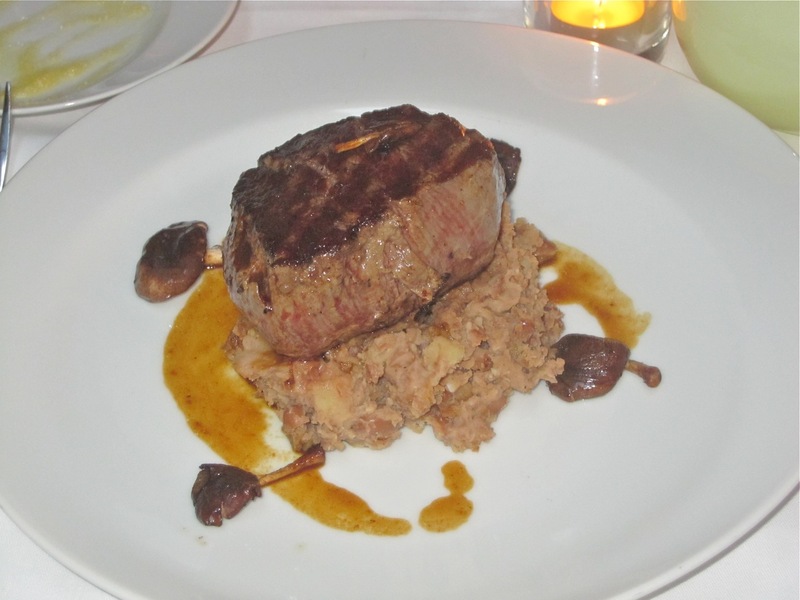 I had the Brazilian filet steak with refried beans and grilled shiitake mushrooms (450 CZK). It was confusing because the menu said in English that it came with "green bean purée." In Czech, it just said "bean purée." I was strangely curious to find out what it was. The large lump of brown frijoles refritos that came were a little dry and perhaps not the best complement. I ate about half of it. The four little mushrooms were oddly flavorless. But the beef itself was great. I've had a few better tasting steaks in Prague, but I don't think I've ever had one that was more tender. It was a pleasure just to cut it. Eating it was quite enjoyable, too. We wanted coffee and dessert. It took forever. Our once efficient waiter began fading as the meal went on. He was AWOL by the end. 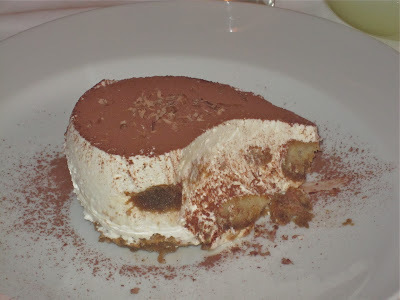 Eventually, I got my homemade tiramisu, (135 CZK). It was a large portion. The mascarpone that made up most of it was very light. Overall, I thought it was lackluster. 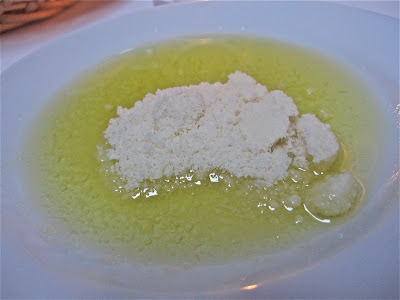 I wished for more coffee-soaked savoiardi and prefer thicker, creamier versions. My friend just had fresh pineapple (90 CZK). The good caffee macchiato (45 CZK) and latte macchiato (65 CZK) came after the desserts. 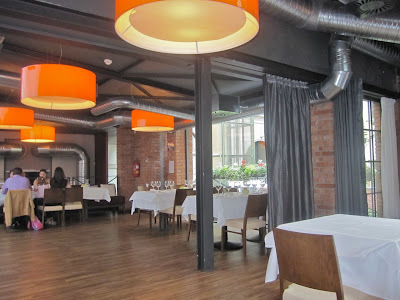 The total bill for the meal was 2050 CZK. That seems like a lot, but I thought it was reasonable when you consider three courses for two people along with Prosecco, wines, and coffees. I thought the prices were quite fair. 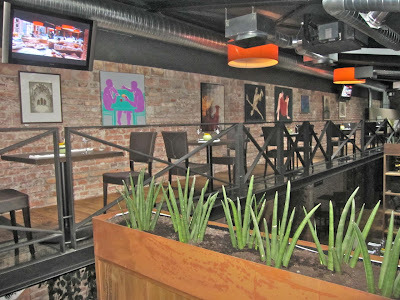 I like the look of the place, and it feels like you are eating in a more expensive place than it is. We appreciated the starters more than the main courses, but nothing was bad. The service was both good and terrible. My friend said our waiter was one of the better ones, so watch out. I'm looking forward to going back and tasting some other dishes. 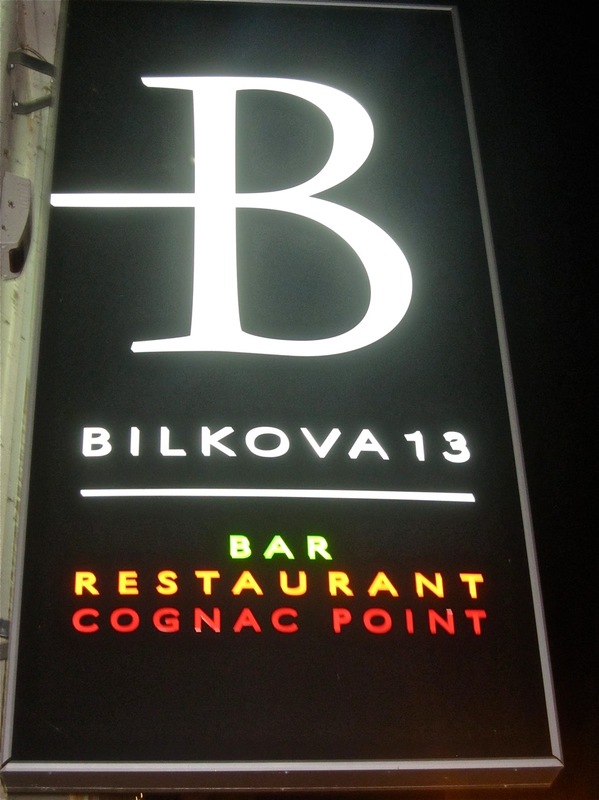 I'm also telling my friends to try Bilkova 13. Unless something unexpected happens, they probably won't be disappointed. Claire Speaks well of you on Prague Post. She will be Missed.